A resource for anyone who is just starting out on the journey to the dance floor, or for those that already know their way around. 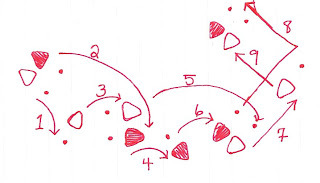 Moving away from the box waltz, we are now going to look at the 6 step Natural and Reverse Turns. You may remember that a Natural turn is one that turns to the Right and a Reverse turn is one that turns to the Left. In order to join the two of these together, we are going to do a Closed Change or Change Step, in between. So! Instead of having four counts of 3 to get around and back to where you started, as you have in the box waltz, you now have two counts of 3 to make 3/4's of a turn and then one more set of 3 to stay on the same alignment but change your feet to enable you to turn the other direction. If you start by thinking that you are going to be travelling down the long side of a room, you should automatically face Diagonal to Line of Dance, Gents, and Ladies, you should be Backing Diagonal Line of Dance. Before you even move your feet, begin to turn your shoulders to the Right. If your frame is good, this will warn your partner that a turn is about to happen and she will instinctively begin to turn her body as well - which will make your whole movement easier. Step forward on your Right foot - if your shoulders are already turning, this "forward step" should be curving as well. On your "side, together" (Left foot then Right) continue turning so that you end up facing directly to the wall that was to your Right when you started. Keeping the shoulders turning to the Right, step backwards (with a slight, natural curve) onto your Left foot, and then step side, together (Right then Left) to finish facing diagonally into the centre of the circle. You then need to do a Closed Change to enable you to start your Reverse turn - so without changing your alignment at all, step forward on your Right foot, and then side, together with your Left then Right. You now have your Left foot free to begin your Reverse turn, but as with the Natural, it is easier if you initiate the turn with your upper body first, so slightly anticipate your first step with a beginning of a turn to the Left through your shoulders. Step forward onto your Left foot and complete the count of three by taking your side, together (Right then Left) ending up facing the wall that you originally (back at the very beginning) had to your Right again. Keeping the shoulders turning, step back onto your Right foot and step side, together (Left, Right) to finish facing Diagonal to Line of Dance again. Complete the set, by doing another Closed Change - with no turn - forward on your Left, Side and together on your Right then Left. Now you are ready to begin again with your Natural Turn. Before your partner takes his first step, he should begin shaping his upper body and turning slightly towards the Right, this is your cue to maintain a good hold and connection with him and likewise start to turn your upper body. This turn will then translate into your feet and will make it easier to accomplish the amount of turn needed on each set of steps. You then need to do a Closed Change to enable you to start your Reverse turn - so without changing your alignment at all, step backward on your Left foot, and then side, together with your Right then Left. You now have your Right foot free to begin your Reverse turn, but as with the Natural, it is easier if the turn is initiated with the upper body first, so pay attention to your partner's frame before the first step; you should feel the beginning of a turn to the Left through your shoulders. Step backward onto your Right foot and complete the count of three by taking your side, together (Left then Right) ending up facing the wall that you originally (back at the very beginning) had to your Right again. Keeping the shoulders turning, step forward onto your Let foot and step side, together (Right, Left) to finish backing Diagonal to Line of Dance again. Complete the set, by doing another Closed Change - with no turn - backwards on your Right, Side and together on your Left then Right. Now you are ready to begin again with your Natural Turn. - Make sure that you extend all your steps... this is intended to move more or less along a line (with bumpy edges). You should never be moving back on yourself or retracing ground that you have already covered. Is the spin turn the same as the natural turn? :S I'm so confused!!! This the basic natural turn and reverse turn combination. Both partners turn together and with mirroring footwork whereas the footwork in the spin turn is very different for both leader and follower.